ESBL-producing isolates of the Enterobacteriaceae occur throughout the world. The objectives of this study were to characterize uropathogenic Escherichia coli isolated at a tertiary care hospital in southern India, and shed light on blaCTX-M sequences of Indian origin. A cohort of 13 urinary isolates of E. coli (obtained from patients at the Sri Sathya Sai Institute of Higher Medical Sciences, Prasanthigram, Andhra Pradesh, India) were characterized and found to be resistant to multiple antibiotics, including extended-spectrum cephalosporins. All 13 isolates contained blaCTX-M-15, and many of them transferred this genotype to at least one laboratory strain of E. coli after conjugation. Analyses of blaCTX-M-15 sequences (n = 141) of Indian origin showed that > 85% of them were obtained from bacteria not associated with the urinary tract, and that E. coli isolates account for majority of all blaCTX-M-15-carrying bacteria reported from India. Other types of blaCTX-M appear to be rare in India, since only six such sequences were reported as of July 2015. The results indicate that ‘selection pressure’ exerted by extended-spectrum cephalosporins may have stabilized the blaCTX-M-15 genotype among E. coli in India. The rarity of other blaCTX-M suggests that they lack the survival advantage that blaCTX-M-15 may have. Diseases caused by extraintestinal pathogenic Escherichia coli (ExPEC) strains among humans are as common and debilitating as those caused by intestinal pathogenic E. coli (InPEC) strains [1, 2]. Uropathogenic E. coli (UPEC) strains are the most common type of ExPEC that cause urinary tract infections (UTIs) and are a global burden [3, 4]. Most of the UPEC isolates are reported to produce extended spectrum β-lactamases (ESBLs) that limit the choice of therapy . These ESBLs hydrolyze extended-spectrum cephalosporins and the genes encoding them are frequently plasmid and/or mobile element-borne [6–8]. Worldwide, CTX-M is the predominant ESBL type and most of the enzymes within this family mediate resistance to cefotaxime and ceftriaxone [9, 10]. In 2001, a derivative of CTX-M-3 was reported from India that “conferred a higher level of resistance to ceftazidime” and was designated CTX-M-15 . In the first systematic survey of E. coli resistant to third-generation cephalosporins in India, it was shown that 73% of the isolates carry blaCTX-M-15 and that many of these genes were associated with IS26 . 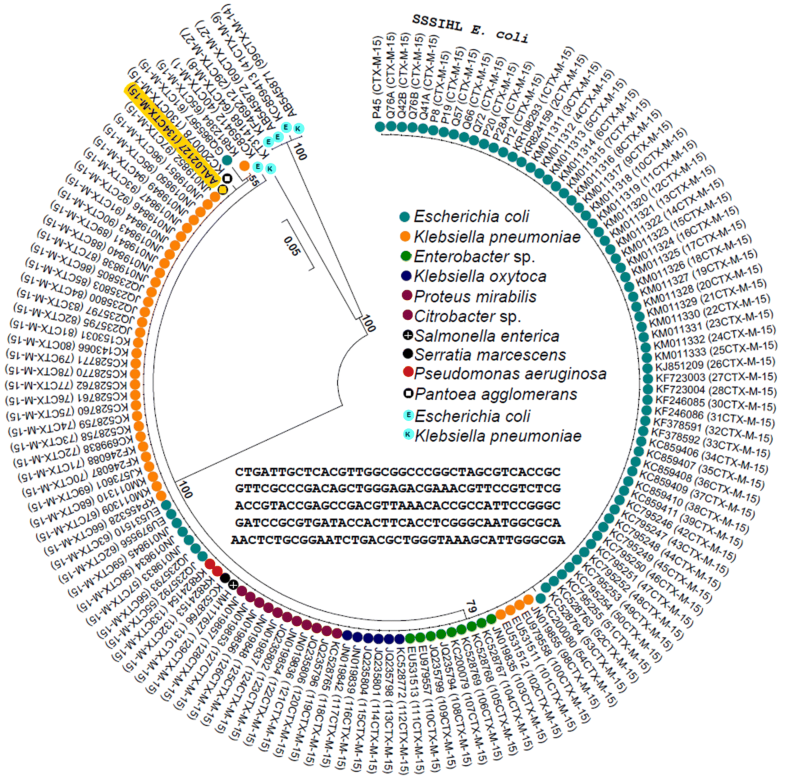 The blaCTX-M-15 genotype appears to be common among E. coli sequence type 131, which is a multidrug-resistant clonal group associated with urinary tract and bloodstream infections [13–15]. Previous studies focused on understanding the features of 16 UPEC ST131 isolates from India revealed that many of them contain large conjugative plasmids encoding the CTX-M-15 β-lactamase . Although the sequences of blaCTX-M-15 from these 16 ST131 isolates are not available, their diversity was reported to be low . It has also been reported that UTI-associated E. coli isolates from HIV patients in India were more likely to contain blaCTX-M-15 than those from non-HIV patients, and that their ESBL phenotype correlated with the presence of blaCTX-M-15 . Although several other reports contain details of ESBL-positive E. coli isolates from India [17–19], systematic analyses of blaCTX-M-15 are lacking. The objectives of this study were to characterize ESBL-producing E. coli isolated at the Sri Sathya Sai Institute of Higher Medical Sciences, Prasanthigram, Andhra Pradesh, India, and to compare the blaCTX-M sequences among these and other bacteria of Indian origin. Bacterial isolates (n = 70) were obtained from the clinical microbiology section of the Sri Sathya Sai Institute of Higher Medical Sciences, Prasanthigram, Andhra Pradesh, India. These isolates represented pure cultures derived from non-HIV patients. The isolates were identified using VITEK 2 systems version 06.01 (bioMérieux). Antibiotic susceptibility testing of the isolates was performed using VITEK-2 AST-N280 cards (bioMérieux) and the results were interpreted based on the clinical and laboratory standards institute guidelines (CLSI M100-S24; 2014). Bacterial chromosomal DNA, obtained after heat lysis of pure cultures , served as the template for amplification of gene segments. Isolates were screened for blaCTX-M, blaSHV, and blaTEM genes using PCR as described previously [21–24]. Primer sequences and thermocycling protocol are provided in Additional file 1. Products amplified by PCR were gel purified, cloned, and sequenced. Horizontal transferability of genes/elements encoding antibiotic resistance was tested using three different E. coli recipient strains in conjugation experiments. These include strain B (a component of the HiPer® bacterial conjugation teaching kit supplied by Hi Media Laboratories Pvt Ltd., Mumbai, India), strain XL1-Blue (supplied by the erstwhile Stratagene, La Jolla, CA), and strain BL-21 CodonPlus (also supplied by Stratagene), which are resistant to streptomycin, tetracycline, and chloramphenicol, respectively. Conjugation protocol is provided in Additional file 1. Clustal omega (http://www.ebi.ac.uk/Tools/msa/clustalo/) was used to obtain an initial alignment of the blaCTX-M sequences. This alignment was used as a guide to manually trim the sequences when they were of different lengths. Progressive alignment of DNA sequences was performed using ClustalW with default parameters. Phylogeny was reconstructed using the maximum likelihood method (with 1000 bootstrap replicates) and the Tamura-Nei substitution/scoring matrix in MEGA 6.0. Thirteen apparently disparate isolates were selected for further study based on them containing plasmids of various sizes (data not shown). The isolates were confirmed as E. coli using the amplification and sequencing of their 16S rDNA genes. The sources of these 13 isolates and the clinical complaints/diagnosis of the patients are listed in Additional file 2. Antibiotic sensitivity testing in the clinical laboratory using VITEK-2 showed that all 13 isolates were resistant to extended spectrum β-lactam antibiotics such as cefazolin, ceftriaxone, and/or cefepime, indicating that they were capable of producing ESBLs (Table 1). However, most of these isolates were sensitive to ertapenem, imipenem, and/or meropenem, indicating that they were carabapenemase negative (Table 1). All 13 isolates consistently tested positive for blaCTX-M, but negative for blaSHV and blaTEM, in PCR experiments. The 13 isolates shown in Table 1 were further screened in the research laboratory for their sensitivity to six antibiotics using LB agar plates. Laboratory strains of E. coli (B, DH5α, XL1-Blue, and BL-21 CodonPlus) were used as controls in these tests. All 13 isolates were resistant to ampicillin and nalidixic acid (100 µg/ml each; data not shown). Except isolate Q57, all others were also resistant to kanamycin (50 µg/ml; data not shown). Data is shown in Table 2 for four isolates (Q41A, Q66, Q72, and Q76A) that were sensitive to streptomycin (100 µg/ml) and tetracycline (60 µg/ml), for three isolates (P8, Q42, and Q76B) that were sensitive to streptomycin but resistant to tetracycline, and for one isolate (Q57) that was sensitive to tetracycline but resistant to streptomycin. Except isolates P20, P28A, and P45, all others were sensitive to chloramphenicol (Table 2). These results suggest that the 13 isolates are sufficiently disparate and non-clonal. Conjugation was performed based on the antibiotic sensitivity of the 10 donor/clinical isolates using appropriate recipient strains. Isolates P8, Q41A, Q42, Q66, Q72, Q76A, or Q76B were conjugated with E. coli strain B as the recipient and produced transconjugants that were resistant to ampicillin and streptomycin (Table 2). Furthermore, transconjugants obtained using isolates P8, Q42, or Q76B were resistant to tetracycline, and transconjugants obtained using isolates P8, Q42, Q66, Q72, Q76A, and Q76B were resistant to nalidixic acid. These results indicate that in some clinical isolates, different resistance determinants were co-located and/or co-transferable. Such mobilizable elements encoding resistance to extended spectrum β-lactam antibiotics and several other antibacterial drugs have been reported among ST131 isolates from India . Isolates Q41A, Q57, Q66, Q72, and Q76A were conjugated with E. coli strain XL1-Blue as the recipient and produced transconjugants that were resistant to ampicillin and tetracycline (Table 2). Interestingly, strain XL1-Blue transconjugants obtained using isolates Q57, Q72, or Q76A readily transferred ampicillin resistance to strain B after secondary conjugation (data not shown). However, none of the strain B transconjugants that were sensitive to tetracycline could transfer ampicillin resistance to strain XL1-Blue after secondary conjugation. This indicates that some strain XL1-Blue transconjugants, unlike those of strain B, possess the traits to serve as donors, and that conjugative elements borne by some strains (such as Q41A and Q66) may require host-derived factors for their efficient mobilization. Escherichia coli strain BL-21 CodonPlus is generally used for protein expression and contains a ColE1-compatible pACYC-based plasmid (~ 3.5 kb) that confers chloramphenicol resistance. The suitability of this strain as a recipient in conjugation experiments has not been reported. Isolates P8, P12, P19, Q41A, Q42, Q57, Q66, Q72, Q76A, or Q76B were conjugated with strain BL-21 CodonPlus as the recipient and produced transconjugants that were resistant to ampicillin and chloramphenicol (Table 2). The presence of blaCTX-M in ampicillin-resistant strain B, XL-1 Blue, or BL-21 CodonPlus transconjugants was confirmed using PCR (data not shown). From each of the 13 isolates, ~ 541 bp fragment of the blaCTX-M gene was amplified by PCR, cloned, and sequenced. Sequence comparison by blastn indicated that all 13 isolates carried a blaCTX-M-15 gene (GenBank accession numbers are shown in Table 2). For further comparison, a total of 133 blaCTX-M sequences deposited in GenBank from various parts of India from February 2008 to July 2015 (plus the first blaCTX-M-15 sequence with the accession number AAL02127 submitted in July 2001) were obtained (Additional file 3). Since the sequences varied in length, they were trimmed to obtain a 191 bp internal fragment after multiple sequence alignment. A maximum likelihood phylogenetic tree (with 1000 bootstrap replicates) constructed using 147 blaCTX-M sequences showed that 96% of them (141/147, including 13 from the isolates characterized in this study) cluster together (Fig. 1). Among the 141 sequences that were compared in Fig. 1, the 191 bp internal fragment was almost identical, indicating the genetic homogeneity of blaCTX-M-15. Not surprisingly, 51% (72/141) of the sequences were from E. coli isolates, and 26% (37/141) were from Klebsiella pneumoniae isolates. Interestingly, two sequences were from Pseudomonas aeruginosa isolates causing ocular infections (Additional file 3). Furthermore, only 13% of the sequences (19/141) were from E. coli cultured using urine samples. Other types of blaCTX-M appear to be rare in India, since only one sequence for each of blaCTX-M-1, blaCTX-M-8, blaCTX-M-9, and blaCTX-M-14 and two sequences of blaCTX-M-27 were found in the GenBank database. These blaCTX-M sequences were also from E. coli and K. pneumoniae (Fig. 1 and Additional file 3). In a previous study assessing the drug resistance of 16 ESBL-producing E. coli isolates, it was reported that 84% were resistant to ciprofloxacin . Furthermore, resistance to extended spectrum β-lactam antibiotics and fluoroquinolones among UTI-associated E. coli isolates from HIV patients was reported to be significantly higher than those from non-HIV patients . Co-resistance to ciprofloxacin and at least one extended spectrum β-lactam antibiotic has also been reported among E. coli isolates from pregnant women . In the current study, eleven isolates (85%) were found to be resistant to ciprofloxacin. These results suggest that fluoroquinolones are not a good choice in the Indian scenario for treating ESBL-producing E. coli. Based on previous reports  and current work, it appears that at least 70% of UTI-associated ESBL-producing E. coli isolates could be sensitive to chloramphenicol. This sensitivity may be due to infrequent use of chloramphenicol in humans, and provides a choice to clinicians to prescribe the drug for life-threatening infections caused by E. coli. The results of the conjugation experiments indicate that the blaCTX-M-15 gene was borne on a mobile genetic element in each donor strain. It was obvious from this study that members of the Enterobacteriaceae are the majority among all potentially ESBL-producing bacteria of clinical relevance in India. It appears that the genetic and epidemiological features of CTX-M β-lactamases have not changed much since the first systematic survey reported in 2006 . Sequence analyses indicated that E. coli isolates account for at least 50% of all blaCTX-M-15 carrying bacteria, and that other types of blaCTX-M are rare in India. Therefore, there is likely a “strong selection pressure” for the maintenance and dispersal of the blaCTX-M-15 genotype among pathogenic E. coli in India. In view of this, diagnostic laboratories should routinely test clinical isolates of E. coli for blaCTX-M-15, and hospitals should develop and implement an antibiotic stewardship program to reverse the trend. This work relied on few ESBL-positive UPEC isolates from a single hospital. Studies using many isolates from different hospitals could provide broader insights into ESBL-positive UPEC in India. For conjugation experiments, three different recipient strains of E. coli were used. A single recipient E. coli strain could help in better assessment of horizontal gene transfer. This study used blaCTX-M-15 sequences available in GenBank regardless of the origins of the host strains. Future studies could look into the distribution of blaCTX-M-15 among clinical and non-clinical strains. SS: contributed to designing the study, performed sequence analyses, and wrote the manuscript; BT and RB: performed plasmid profiling, PCR, and conjugation experiments; KP, RD, BM, and NM: isolated the bacteria and identified them using VITEK 2; BEP: designed the study, interpreted the results, and contributed to drafting the manuscript. All authors read and approved the final manuscript. The authors wish to thank Ms. Vandana Viswanathan, Ms. Neha Gupta, and Mr. Kalmesh Vyaparagi of IBAB for providing technical assistance. The authors also wish to thank Ms. Anushree Narjala for help with phylogenetic analysis. DNA sequences generated as part of this work have been deposited in GenBank (Accession Numbers: KU987444, KT956436, KY568704, KT956438, KY568702, KY568703, KT956439, KU987443, KX009505, KT956440, KT956441, KT956442, and KX009504). E. coli isolates and protocols used in the study are available from the corresponding author. Since patient identities were not sought for the study, consent for publication is not applicable. The Institutional Ethics Committee of the Sri Sathya Sai Institute of Higher Learning (ECR/616/Inst/Ap/2014/RR-17) reviewed and approved the project (SSSIHL/IEC/PSN/BS/2014/03). Since this was a retrospective study, informed patient consent is not applicable. Research at IBAB is continuously supported by the Department of Innovation and Technology of the Government of Karnataka. This work was primarily supported by funds provided through the FAST TRACK SCHEME FOR YOUNG SCIENTISTS (06/2012 to 05/2015) of the Science and Engineering Research Board of the Department of Science and Technology, Government of India to B.E.P. Research infrastructure at the Department of Biosciences, SSSIHL, Prasanthi Nilayam was set up with funds from the Government of India through UGC-SAP (DRS), DST-FIST, and DBT-BIF. Research infrastructure at IBAB was set up with funds from DST-FIST. 13104_2018_3735_MOESM1_ESM.pdf Additional file 1. Primer sequences and thermocycling protocol. 13104_2018_3735_MOESM2_ESM.pdf Additional file 2. Clinical isolates used in this study and their sources. 13104_2018_3735_MOESM3_ESM.pdf Additional file 3. Details of blaCTX-M sequences deposited in GenBank from various parts of India that were used in this study.